Feel like some brain-teasing fun? You’ve got a new friend! His name is Einstein, Professor Einstein. He’s an entertainer, educator and loves to chitchat. He discusses the weather and famous people with you and will teach you science, math, or anything in-between. 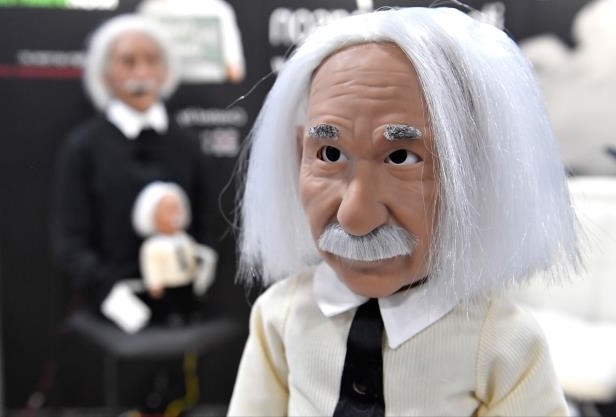 Professor Einstein is the latest in robotics. This robot can smile, frown and even stick his tongue out to name just a few of the 50 gestures. Where to chat with Professor Einstein? Professor Einstein could be your new friend at the reception desk of your business. He could just as well contribute his geniality to your next event as a host, in a combination of talking about scientific facts and pure entertainment. Are you ready for some brain-teasing fun? We design and organize events with robots. Let’s talk!